Target2-Securities (T2S), the pan-European securities settlement engine initiated by the European Central Bank (ECB), is almost upon us. The first wave of Central Securities Depositories (CSDs) are to migrate to the platform on June 22. As they complete their preparations, Christian Houillon, T2S Programme Manager for BNP Paribas Securities Services, tells us about the testing phase and what the custodian bank is doing to guarantee its clients a seamless transition. 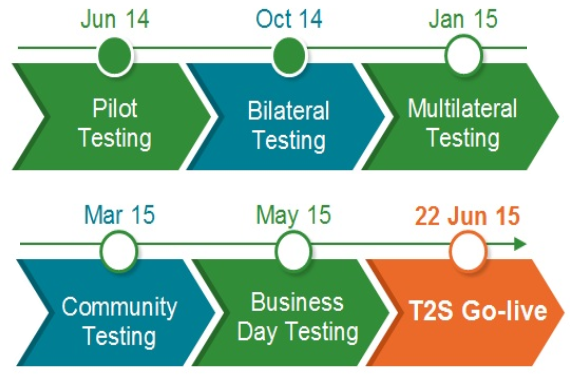 Could you briefly remind us of the T2S testing plan? The ECB completed its internal tests – Eurosystem Acceptance Tests (EAT) – at the end of September 2014. The validation of the results by the T2S board allowed the user testing to start as of October 1, as scheduled. While some defects still exist none have been deemed blocking and a resolution plan has been implemented to swiftly correct all anomalies. User testing is composed of several phases. During bilateral testing, CSDs and national central banks will test their adaptations with the Eurosystem, in isolation of other CSDs and central banks. Then during the multilateral testing phase, currently underway, each CSD tests settlement processes with the other participating CSDs and central banks within its migration wave. From the beginning of March until mid-May, each CSD extends its testing activities with other CSDs and central banks to include its participants. Finally, from mid-May several consecutive business days of operations will be simulated with all T2S users. What precisely do CSD participants, such as BNP Paribas Securities Services, need to test? First and foremost, CSD participants need to verify that their settlement processing has been properly adapted to the T2S environment. During the community testing phase, they will have the possibility to freely run their own tests, but also they will have to prove they comply with the CSD requirements by passing mandatory tests called "CSD authorization tests." As an example, in Monte Titoli there are 25 authorization test scenarios for directly connected participants (DCPs) among which 21 are mandatory. Their purpose is to make sure we will be able to use the specific services Monte Titoli will provide in the T2S timeframe as well as those out of T2S scope (e.g. coupon stripping, external cross-border settlement). This includes the new corporate actions processing implemented by Monte Titoli to match corporate actions standards and which will go live at the same time as T2S. On top of these CSD tests, BNP Paribas Securities Services will also have to get certified by the Eurosystem (by the end of March 2015) as a DCP, which also demands mandatory tests to be performed successfully. In addition, BNP Paribas Securities Services as a Payment Bank in T2S with Banque de France, will also be asked to test some cash-related scenarios. And to end with infrastructures, we will have also to validate our processing with CCPs that also adapted their platform in the perspective of T2S. That's a lot to carry out. Are you confident about completing everything on time? Indeed the testing schedule is quite challenging as we will have to complete all tests and certifications in less than 3 months. By the way, did I mention there will be migration rehearsals too in the same timeframe? Fortunately, we have taken steps to anticipate this. Firstly, we started our project in 2010, with a clear strategy and solution definition that have not really changed, which allowed us to concentrate on their implementation. One of the key pieces is our single settlement platform already deployed in Italy and Germany, and across Asia and Latin America, before the project began. We launched installation for the Euronext markets in early 2010 and this major project was completed at the end of 2013, well ahead of their T2S migration in wave 2. Spain is next, the platform is already up and running for the Fixed Income market, and will go live in October 2015 for Equities, simultaneously to the Spanish Market Reform. We also took the opportunity given by the replacement of the National Bank of Belgium settlement and custody platform to develop the ISO 20022 messages we will reuse for T2S. The go-live went very well this last February, which allows us to fully focus on the Italian market specifics. Are BNP Paribas Securities Services' clients involved? Our main objective, which answers our clients' number one request, is to shield them from T2S changes. Our clients' adaptations will be kept to the minimum, they will be able to reuse the same messages they are using today. At the same time, they will be able to benefit from most of our new T2S enhanced services through account settings. Some clients may have limited actions to be taken though, such as to review their SSIs and their counterparties', and make sure they will be able to handle matching criteria required by T2S. Then there might be some T2S advanced features, such as linkage and pooling, which may trigger more significant adaptations, but these are fully optional and can be undertaken after T2S go-live. Whatever the client chooses, we propose a dedicated timeframe for them to test with us the modified messages. These messages have been thoroughly documented with samples, taking into account market specifics. Do you have any recommendations for clients? T2S is coming soon. The Eurosystem has just validated the environment production and so far tests have gone well. Wave 1 CSD participants are already invited to specify their account structure and settings that will be frozen on March 25 according to the last available schedule, and should remain unchanged up until four weeks after T2S go-live. Should participants foresee some changes in this timeframe, it is important they let their custodian know so we can assess the feasibility and the best way to accommodate their needs. The benefits of the T2S programme are clear, and we are eager to see the platform up and running. Our focus now is on supporting our clients through the change and shielding them from any operational burden. The industry is working together for a smooth migration to T2S!